In winter, Old Faithful Snow Lodge offers a truly unique experience. From this snowy haven, you can set out on a variety of explorations, either on your own or with a knowledgeable guide. Take one of many different snowcoach tours – like one to the Canyon area, where you will find the famous, frozen Lower Falls. Rent some skis or snowshoes, and explore any number of trails, of all different ability levels – with a guide, or without. Enjoy the fire as you sip a hot beverage in our lounge, while the snow falls lazily outside. Old Faithful Snow Lodge elevation is approximately 7300 feet. 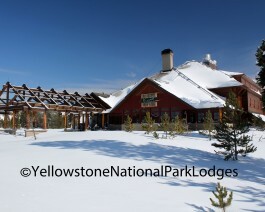 In winter, access to the Snow Lodge is by National Park Service approved over the snow transportation only.